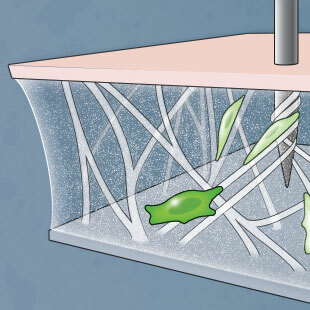 When locked-long, the endomysium cross-linked fibers are pulled horizontally, and they become increasingly more parallel to the muscle fiber length. 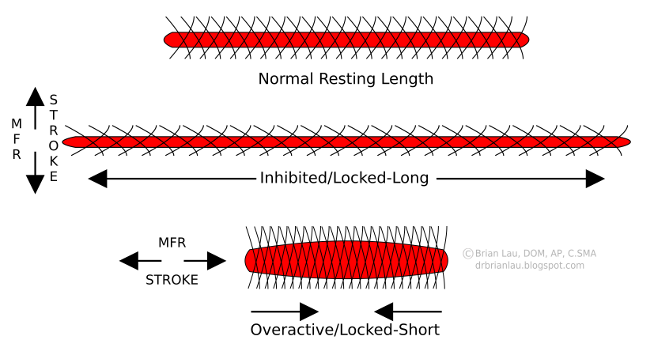 A slow, sustained myofascial release stroke in the direction of the muscle fiber would further move these fascial fibers into this parallel arrangement, which could ultimately be counterproductive for long-term change of the patient. However, this same slow, sustained myofascial release stroke perpendicular to the fiber direction would result in a positive re-balancing of the fascia, which would enhance the ability of the muscle to return to its normal resting length. 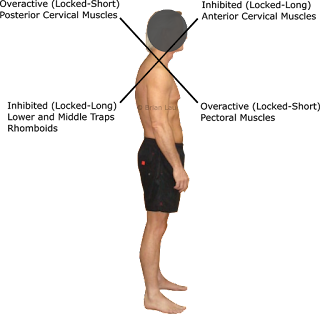 So, in effect, this stroke against the muscle fiber direction could be considered a tonification technique. However, the pectoralis minor, part of the Lung sinew channel, would be in a shortened position (excess) and would benefit from an MFR stroke in a direction with the muscle fibers; a sedating technique.4 This directional stroke would reorganize the fascia and provide the most precise communication to the tissue. How does acupuncture fit into this? First of all, proper needling to the motor points of both the locked-long and locked-short structures would help reset the dysfunctional muscle-spindle relationship of these muscles, and the myofascial release would help reset the fascia. Imagine a patient with overpronation of the foot. The peroneals are now in an overlengthened position and are pulled up fascially, much like a shirt sleeve that is pulled up on the arm. 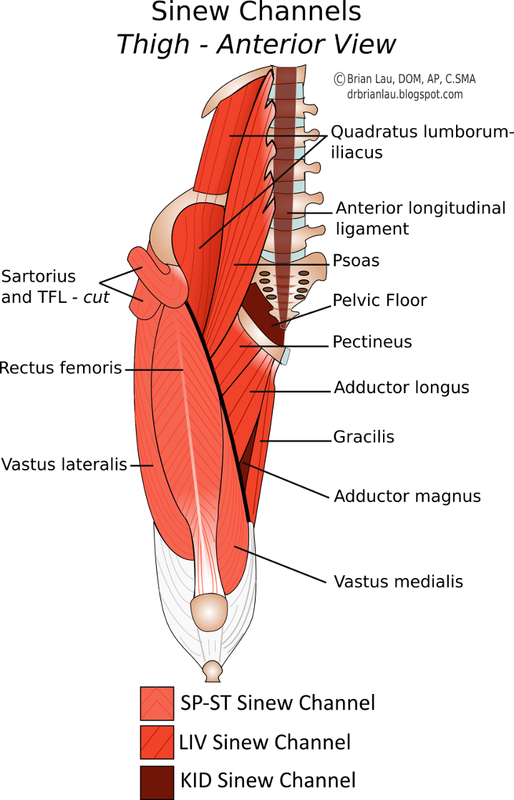 Needling the motor points of peroneus longus and brevis, winding the needle, and them pulling downward, will help reset the dysfunctional muscle and fascia. Following this with a deep cross-fiber spreading of the tibialis anterior will balance the relationship of the tibialis anterior with the peroneals. 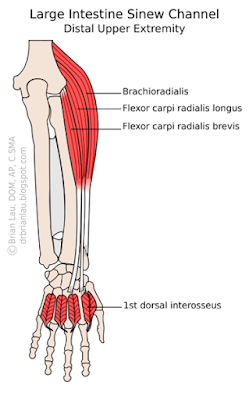 This will balance Earth (tibialis anterior/Stomach sinew channel) with Water (peroneals/Urinary Bladder sinew channel). *This technique is best taught in a classroom setting. Please do not attempt unless you have practiced under supervision first. 1. Purslow, Peter P. "Muscle Fascia and Force Transmission." Journal of Bodywork and Movement Therapies 14.4 (2010): 411-17. Web. 2. Spina, Andreo A. "The 'Direction' of Fascia." Web log post. 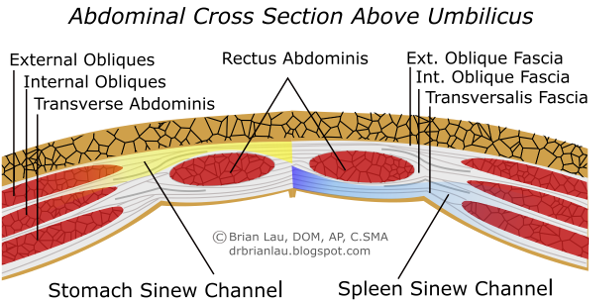 Functional Anatomy Blog. 10 Mar. 2011. Web. 16 Feb. 2016. 3. Myers, Thomas. 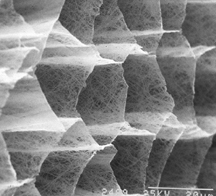 "Lengthening Fascial Tissue: Working with the Grain." Web log post. Anatomy Trains. 25 June 2014. Web. 16 Feb. 2016. 4. 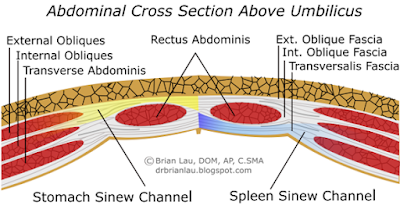 Lau, Brian S. "Anatomy of the Sinew Channels Module 2: Head, Neck, and Upper Extremities." Sports Medicine Acupuncture Certification: Anatomy, Palpation, and Cadaver Lab. Pacific College of Oriental Medicine, San Diego. Lecture. 5. Callison, Matt. 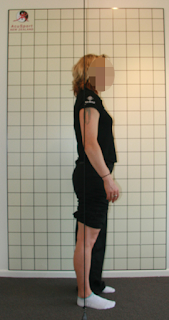 "Assessment and Treatment of Lower Extremity Injuries." Sports Medicine Acupuncture Certification. Marina Village, San Diego. 17 Oct. 2015. Presentation. 6. Langevin, Helene M. "The Science of Stretch." The Scientist Magazine. 1 May 2013. Web. 16 Feb. 2016. This post will discuss hand and finger pain, especially along the Large Intestine channel distribution. This will be relevant to pain associated with osteoarthritis and/or pain associated with myofascial trigger points referrals. We will also look at how certain muscle referral patterns can overlap and combine to increase the amount of pain in a particular region. 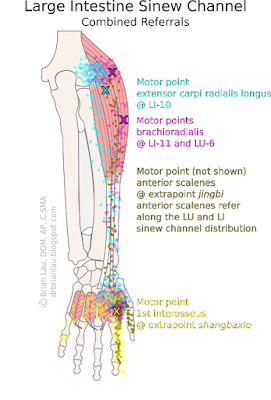 In this case, we will examine pain in the LI-4 – LI-1 region, which can be associated with the first interosseous muscle, the extensor carpi radialis longus, the brachioradialis, the anterior scalenes, and often a combination of these muscles. Needle technique for the first interosseous muscle involves locating the head of the second metacarpal and palpating along the bone in a proximal direction until a node is felt (this is fairly close to the head of the metatarsal). This node is the muscle belly of the first interosseous. 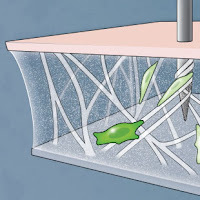 The guide tube can be placed immediately distal to this node and the needle can be advanced in a proximal and medial direction into the belly of the first dorsal interosseus muscle. A strong da qi sensation will be felt, and often a muscle fasciculation will be illicited once the needle makes contact with the point. This is seen at the end of the video below as the finger suddenly abducts. * Jingbi should only be needled by those with appropriate clinical training and experience, due to its proximity to the pleural dome and the risk of a pneumothorax. 1. Chaitow, L., DeLany, J., & Chaitow, L. (2008). Shoulder, arm, and hand. In Clinical application of neuromuscular techniques: Volume 1 (2nd ed., pp. 529-530). Philadelphia, PA: Churchill Livingstone Elsevier. 2. Alexander, C. J. (1999). Heberden's and Bouchard's nodes. Annals of the Rheumatic Diseases, 58(11), 675-678. 3. Simons, D. G., Travell, J. G., Simons, L. S., & Travell, J. G. (1999). Interosseous muscles of the hand, lumbricals, and abductor digiti minimi. In Travell & Simons' myofascial pain and dysfunction: The trigger point manual (2nd ed., pp. 786-793). Baltimore: Williams & Wilkins. 4. Callison, M. (2007). Wrist and fingers. In Motor point index: An acupuncturist's guide to locating and treating motor points (p. 90). San Diego, CA: AcuSport Seminar Series LLC.